This section presents an example that shows how to find the minimum of Rastrigin's function, a function that is often used to test the genetic algorithm. Global Optimization Toolbox software contains the rastriginsfcn.m file, which computes the values of Rastrigin's function. The following figure shows a plot of Rastrigin's function. 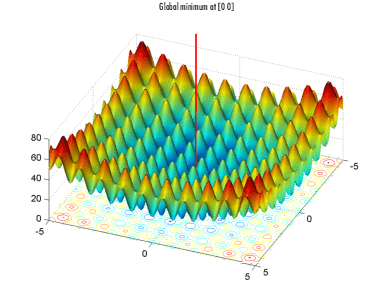 As the plot shows, Rastrigin's function has many local minima—the “valleys” in the plot. However, the function has just one global minimum, which occurs at the point [0 0] in the x-y plane, as indicated by the vertical line in the plot, where the value of the function is 0. At any local minimum other than [0 0], the value of Rastrigin's function is greater than 0. The farther the local minimum is from the origin, the larger the value of the function is at that point. Rastrigin's function is often used to test the genetic algorithm, because its many local minima make it difficult for standard, gradient-based methods to find the global minimum. 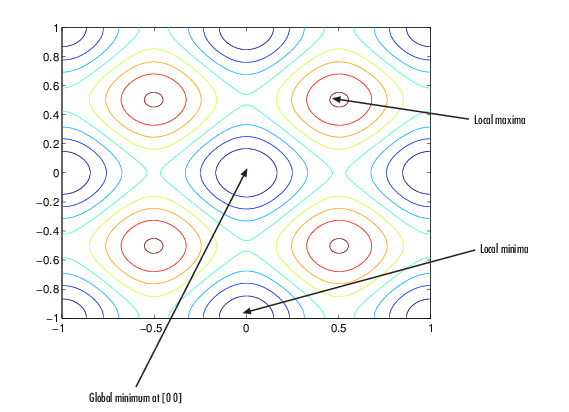 The following contour plot of Rastrigin's function shows the alternating maxima and minima. This section explains how to find the minimum of Rastrigin's function using the genetic algorithm. Because the genetic algorithm uses random number generators, the algorithm returns slightly different results each time you run it. Enter optimtool('ga') at the command line to open the Optimization app. In the Fitness function field, enter @rastriginsfcn. In the Number of variables field, enter 2, the number of independent variables for Rastrigin's function. The Fitness function and Number of variables fields should appear as shown in the following figure. Click the Start button in the Run solver and view results pane, as shown in the following figure. While the algorithm is running, the Current iteration field displays the number of the current generation. You can temporarily pause the algorithm by clicking the Pause button. When you do so, the button name changes to Resume. To resume the algorithm from the point at which you paused it, click Resume. When the algorithm is finished, the Run solver and view results pane appears as shown in the following figure. Your numerical results might differ from those in the figure, since ga is stochastic. Note that the value shown is very close to the actual minimum value of Rastrigin's function, which is 0. Setting the Initial Range, Setting the Amount of Mutation, and Set Maximum Number of Generations describe some ways to get a result that is closer to the actual minimum. The reason the algorithm terminated. The final point, which in this example is [-0.002 -0.001]. average change in the fitness value less than options.FunctionTolerance. x is the final point returned by the algorithm. fval is the fitness function value at the final point. exitflag is integer value corresponding to the reason that the algorithm terminated. The Optimization app Plot functions pane enables you to display various plots that provide information about the genetic algorithm while it is running. This information can help you change options to improve the performance of the algorithm. For example, to plot the best and mean values of the fitness function at each generation, select the box next to Best fitness, as shown in the following figure. When you click Start, the Optimization app displays a plot of the best and mean values of the fitness function at each generation. When the algorithm stops, the plot appears as shown in the following figure. The points at the bottom of the plot denote the best fitness values, while the points above them denote the averages of the fitness values in each generation. The plot also displays the best and mean values in the current generation numerically at the top. Select Axes Properties from the Edit menu in the plot window to open the Property Editor attached to your figure window as shown below. In the Y Scale pane, select Log. The plot now appears as shown in the following figure. Typically, the best fitness value improves rapidly in the early generations, when the individuals are farther from the optimum. The best fitness value improves more slowly in later generations, whose populations are closer to the optimal point. When you display more than one plot, you can open a larger version of a plot in a separate window. Right-click (Ctrl-click for macOS) on a blank area in a plot while ga is running, or after it has stopped, and choose the sole menu item. Plot Options describes the types of plots you can create.